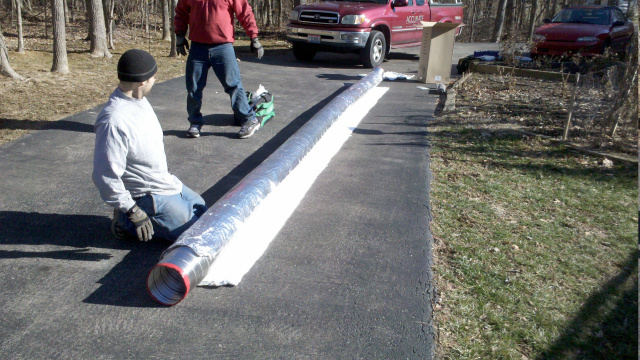 Chimney Liners | Discount Chimney Supply, Inc.
Click this link for directions on "How to Install a Chimney Liner"
Read our FAQ's for importance of properly insulating a chimney liner. 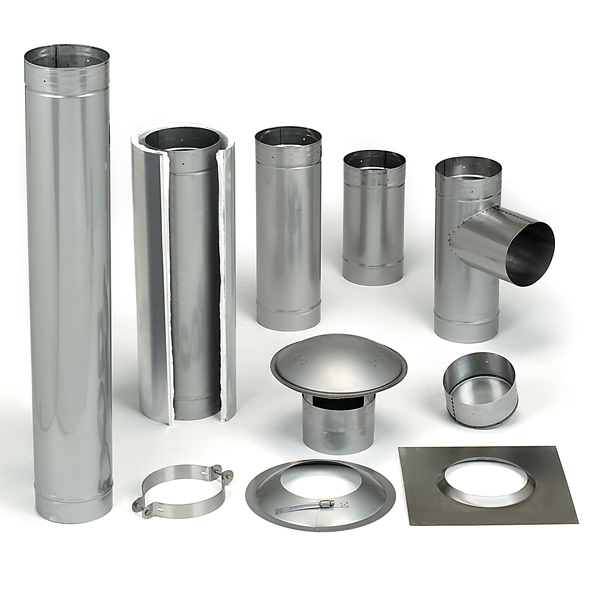 We carry many different sizes, shapes, brands, grades and construction in stainless steel chimney liners including “Homesaver ( Ultra-Pro, Pro, Round-Flex, Oval-Flex, Rectangle-Flex, and Dial-A-Flex), Ventinox, Forever-Flex, Armor-Flex”, and more. The most popular items and packages are listed but we have too many items to list individually. Please contact us for the best prices on unlisted chimney liner items and those for special applications. What type of stainless steel chimney liner do I need? That depends on the job. Here are some guidelines to help make the best decision for your job. These chimney liners have good corrosion resistance in flues using wood burning and pellet burning appliances. (Note: We currently have listed and promote the 316-Ti liners due to their superiority for multiple applications. In a rare occurrence we have seen 304-alloy liners deteriorate from unknown factors. Because of this and minimal cost difference we recommend the 316-Ti liners even for wood use). Made by adding molybdenum and titanium to 304-alloy. This combination gives chimney liners excellent corrosion resistance in acidic and high heat environments. Most of our light chimney liners are using this alloy. Including Homesaver UltraPro, DuraFlex, DCS Flex, Foreverflex, M-Flex, and more. These liners can be used for wood, coal, oil, gas, pellet, and corn. 316-alloy: This alloy is made by adding molybdenum to 304-alloy. This process makes the chimney liner more expensive than 304-alloy but greatly increases the corrosion resistance. This makes it an excellent choice for wood, coal, oil, pellet, corn, and non-condensing gas applications. 321-alloy: Made by adding titanium to 304-alloy to the chimney liner, which improves corrosion resistance at higher temperatures. (Its corrosion resistance in acidic environments is not as good as 316-alloy). This is the most corrosion resistant of all alloys used. Primarily for gas applications. Recommended for appliances with efficiency ratings over 83%, and higher than CAT-1. 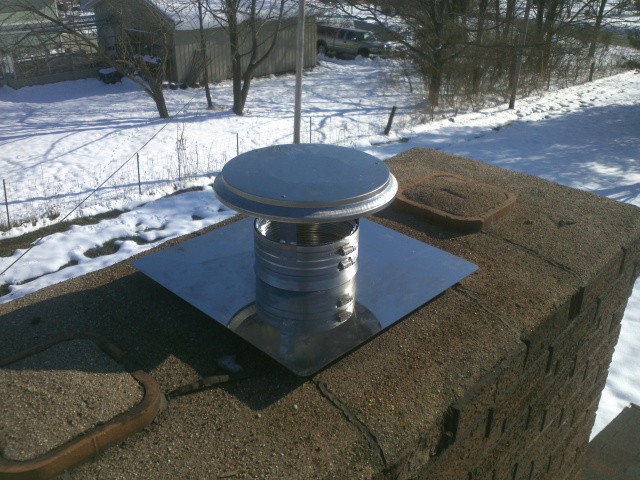 (Note: if the flue being lined has been used previously for oil, a stainless chimney liner is recommended as the outside contamination can quickly destroy an AL 29-4C liner. Thorough cleaning of the flue prior to installation, and use of insulation as a barrier is recommended if oil residue is present). There are three different classifications or weights of flexible chimney liners, in multiple alloy options, produced by multiple manufacturers. We choose only liners that we have had trouble free experiences over our twenty plus years of experience in the field. Light - Most economical chimney liner. Moderate to low flexibility. Harder to straighten. Low crush resistance. Very light weight. .005"-.006" metal thickness. Knurled or pressed seams. High-Performance Light - In the middle on price. Has the highest bending range. Easy to straighten. Strong engineered corrugations = Good crush resistance. Very light weight. Gas tight seams. .005"-.006" metal thickness. 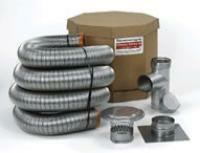 Heavy - Most expensive and durable chimney liners, rugged multi-layer construction. Lower bending range. Easy to straighten. Extremely Crush Resistant. .015" metal thickness. Considered "smooth" inner wall design. Interlocked seams are very strong, but not gas-tight. The heavy chimney liner can also put up with the most aggressive types of cleaning where the others could not. This is not a concern when the liner is properly insulated but an un-insulated liner theoretically could develop a layer of creosote too tough to be removed properly in light style steel chimney liners. Improperly insulating a chimney liner may also void the manufacturers warranty and may not meet the criteria for the UL listing.